GREEN VALLEY, Ariz. — Former white house strategist, Steve Bannon, was in Green Valley tonight. The campaign group “We Build A Wall” brought him in for a town hall meeting about the group’s plans in funding President Donald Trump’s border wall. 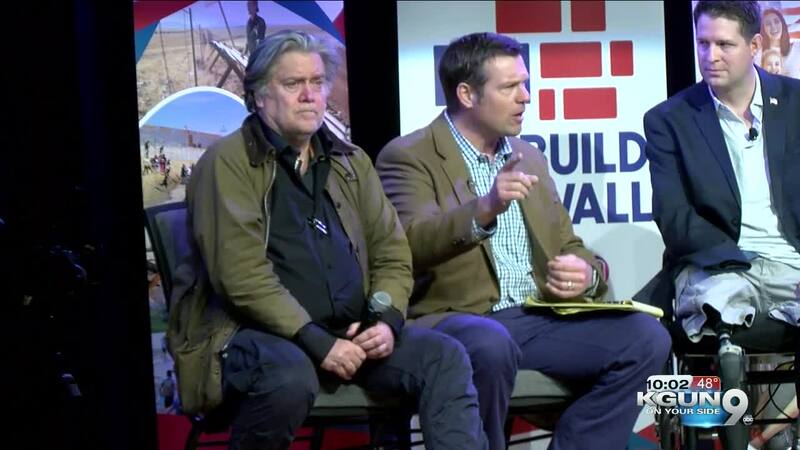 "I think the President will - I don't think he'll take anything short of actually building the wall," said Bannon. "We Build A Wall" is working to first build on private land working with property owners along the border. "That's why you're seeing so many people in this grassroots movement say, 'Yeah, I want to do that I want to help that private poetry owner build that wall," said Kris Kobach, former Kansas Secretary of State. Members of the club asked questions ranging from how negotiations are going for the "We Build A Wall" group, to President Trump possibly declaring the border wall as a national emergency. "It's heartening to me to see, after so many years of talking about it , were actually having action. And I think that's what President Trump sees. President Trump now knows that it's time to get on with it," said Bannon. Meanwhile, a protest took place outside of the building. Those against the wall held signs opposing this meeting and Bannon's arrival. "Immigration and housing children in cages, and mistreating people and being racist. Everything about it is wrong," said Judy Sypkens, who is against the border wall being built.